Michael McFadyen's Scuba Diving - Tupia Point The Eastern Suburbs of Sydney are blessed with excellent beaches. The most famous of these, Bondi, is world renowned. Other beaches such as Maroubra and Coogee are just as good, if not better than Bondi. Maroubra has better surf and Coogee is safer (surf-wise) for families. Further south of Maroubra is Malabar Beach which is also excellent for families. Located at the northern end of Long Bay, Malabar is infamous for its sewage treatment works and the Long Bay "Hilton" (Long Bay Gaol). 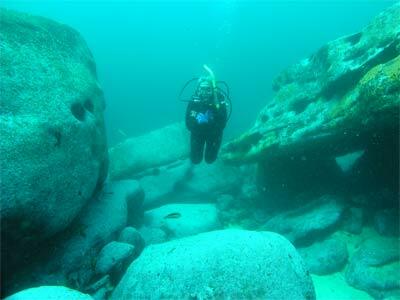 For scuba divers, Malabar has some excellent dive locations. These include the wreck of the MV Malabar (after which, of course, Malabar was named), Long Bay South and Red Flag. On the southern side of Long Bay, about 1000 metres past the Long Bay South dive site mentioned above, there is a spot that my brother Stephen and I had been trying to dive for more than nine years. Unfortunately, circumstances were always against us, with the seas always being too big for the times we had access to a boat in that area (no dive boat regularly dives this area). I even tried a number of times to do it as a shore dive but even in calm seas had trouble finding an easy entry and exit. Finally, in early July 1997 I got the chance to dive this site. I also did this dive again in May 2000. Located at the far southern end of Randwick Golf Club where it meets The Coast Golf Club, Tupia Point can be easily found by looking at a map or chart for the location of the point itself. Select any location along the point, run in towards the rock platform and drop anchor when the reef is seen on your depth sounder. Due to the nature of the reef (it is not very wide), you may have trouble anchoring safely in certain winds, especially southerly and easterly, and may need to do this dive as a drift. A good spot to anchor is 33° 58' 44"S 151° 15' 29" E (using AUS66 as datum - see my GPS Page for more information). As you drop to the bottom you see that the bottom is predominantly composed of boulders, both huge and quite large. Closer to the shore the reef drops from the rock platform to five metres in some spots before dropping deeper. The reef ends at 22 metres or more just 20 or so metres off the rock platform. This dive site has a large number of swim-throughs, caves and tunnels. They are everywhere and range in size from tight squeezes to large tunnels. The fishlife here is quite good, with yellowtail, ladder-finned pomfrets, nannygais and seapike being prolific in spots. Many species of leatherjackets, including black reef, six-spinned and rough can be seen here. There were also a number of large cuttlefish as well as a few moray eels. There is also part of a shipwreck here, although there is no record of it in the NSW Shipwreck Database. There is a small inlet and the wreckage is in shallow water (eight metres). However, after a bit of thought and looking at it in detail, I think I have the answer. As I indicated above, the MV Malabar was wrecked on a short distance away from this location. This ship was powered by a diesel engine. To supply auxilary power (electricity for lights, winches etc) a separate steam powered engine was installed. Today, this is located on the wreck site. This engine was powered by steam that was heated in two ways. The first was via an auxiliary exhaust gas boiler. This was in the funnel and used the heat of the exhaust to turn water to steam and then run the small steam engine. When in port and the main diesel engine was not working, it was oil fired. It was the first ship to be such equipped. Therefore, what I believe is located at Tupia Point is the funnel and the built in boiler from the MV Malabar. This is lying on its side in 8 metres at the mouth of the small inlet. Perhaps when the Malabar sank, it floated off due to the boiler and then sank a short distance away. An alternative is that the seas rolled it across the bay and up into the shallows. Once again, this is a very good dive site that is very hard to get to unless you have your own boat.